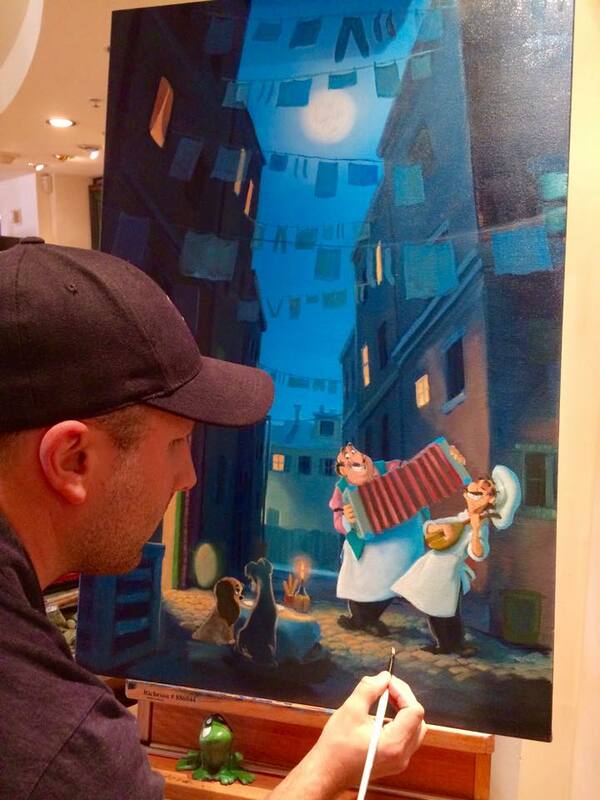 If you’ve been to EPCOT’s International Festival of the Arts over the last few weeks, you may have come across the artwork of Rob Kaz! 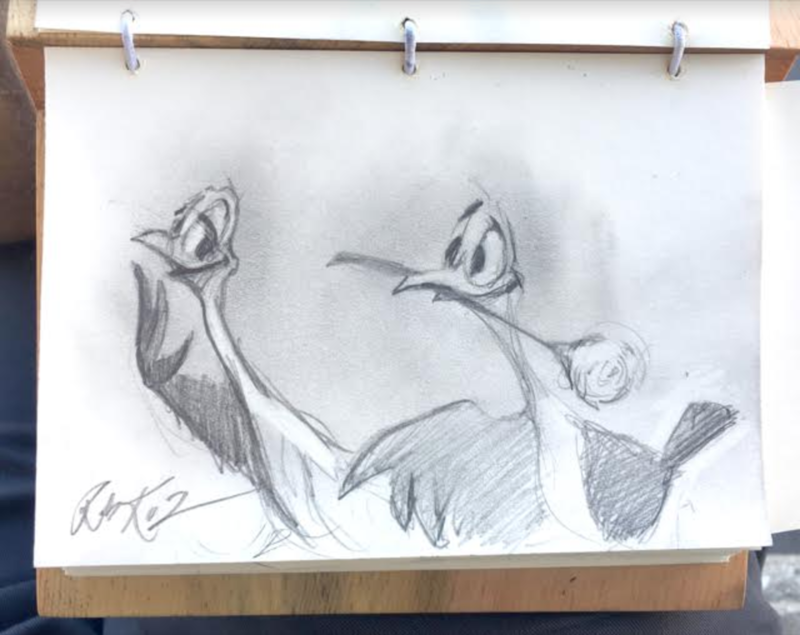 You can still find him and his artwork this weekend (Feb 17 – 20) at the James Coleman Studios location near the Germany Pavilion daily from 2 – 6 PM! 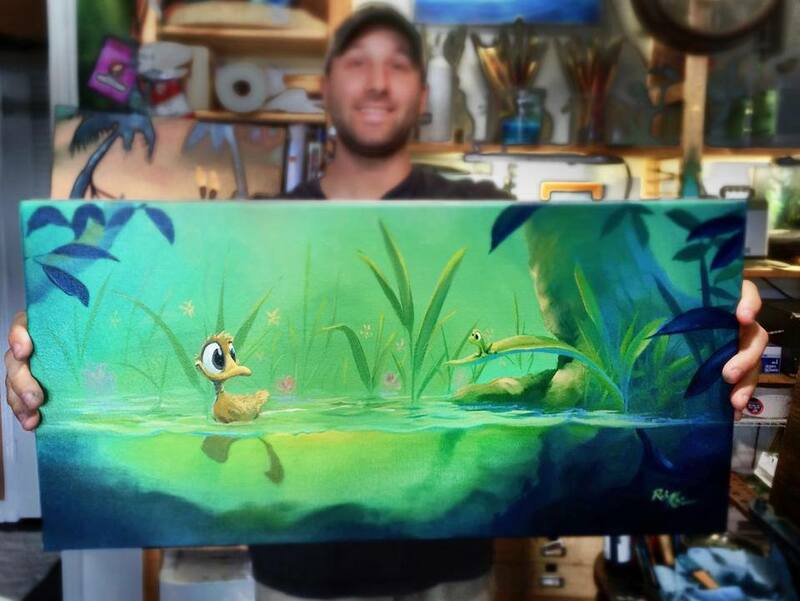 Our writer, Crissy, had the privilege of interviewing Rob; read on to find out more about his art career and relationship with Disney! WDW Hints: Tell us a little about yourself and what it is like being a professional artist. Rob Kaz: I have two passions in life – my family and story telling through art. And the two constantly cross paths. I try to keep art in my home studio, but as my wife will tell you, finding blue paint on the doorknobs or a clay frog sitting on top of potato salad in the refrigerator is the norm around my home. When I first decided I wanted to pursue art as a professional and not just a hobby, I really had no idea where the industry would take me. Luckily, I have a team that handles a lot of the business end of things for me (numbers, schedules, etc. ), but still being a professional artist is truly so much more than just painting. I travel a lot (for shows and appearances), I spend a lot of time on social media sharing my works-in-progress, etc. But of course, most of my day is at the easel creating new works, painting commissions and imagining new worlds for my characters Beau and Friends. When you work from home, it’s very easy to let your work consume from sun up to sun down … especially when a large portion of your clients are on a different time zone (California). However, I try to keep a normal 8 hours a day of work so that I can balance painting and family time. Being a professional artist is in fact a lot busier lifestyle than I ever imagined, but as any artist will tell you – being a busy artist is the best thing you can hope for. WDW Hints: What is your favorite part of creating art for Disney? Rob: I love challenging myself. With Disney, I have that opportunity since the films and characters are so completely different from one another. I especially enjoy painting the characters and films that I consider to be unsung. Though some films get more attention than others commercially, the degree of artistry in all of the films is amazing. The artists that created the backgrounds and environments are sheer genius – truly stunning visuals for those films. When I’m deciding on a new painting, I will often times go through a Disney movie slide by slide and pause to view the scene in its entirety. The backgrounds, the colors, the depth. I recommend this to fans of the films – you can honestly see and appreciate the time, detail and care that the original artist and animators gave to their movie. WDW Hints: You have been at the EPCOT International Festival of the Arts for the past few weeks. Could you share your experience with us? What are you looking forward to during the final weekend? Rob: I have been overwhelmed by the attendance and the reception from guests. The park guests are truly engaged in the experience, they’re excited about art and the process and that enthusiasm is like fuel for me. I absolutely love interacting while I paint. I love answering questions from young artists-in-the-making. I love hearing from collectors who stop by with their phones in hand showing me how they’ve hung or framed my work in their home. I love getting feedback from people about what they have loved from the Festival so far and what they’d like to see next year. Hearing them say “next year” means they are enjoying themselves and want to experience the Festival again. That’s amazing. I’ve also had the chance to walk around the Festival as a guest myself and … wow. Seeing the curated collections from the original masters like Herb Ryman, watching modern day masters like Trevor Carlton and James Coleman, getting photos taken in the giant framed artworks, painting squares on the art wall … the Festival was so much more than I expected it to be. The team putting this event together did an amazing job. Going into this last weekend, I’m super excited to have those last few chances to meet new people. That’s been one of my favorite things about the Festival so far. When new people stumble upon my artwork and then take a few minutes to share their opinions or ask questions in hopes of learning more … that drives me. My personal like of art with Beau and Friends is fairly straightforward – it’s not interpretive or abstract – it’s easy to understand. And yet, it seems each person takes away something unique from the paintings. I love hearing what they see, what they feel. For that reason, I don’t always like to dictate what Beau the frog was thinking when he encountered a lightning bug or a butterfly. Instead, I prefer to hear what the viewer believes Beau was thinking. It makes me smile to see people build their own story from each of the paintings. Story in artwork is so important to me. And to know that my artwork is in fact creating story, unique as it might be for each new viewer, is so special to me and truly makes my day. WDW Hints: What is your favorite piece that you have completed? Rob: I feel like I’m constantly growing as an artist and improving my technique. So, my favorite piece changes often. During the Festival, I had a few moments to sit down in Italy while taking a break. While sitting there, I watched a pair of seagulls and started sketching. Being close to Valentine’s Day, I imagined the seagulls might be in love and this sketch resulted. I don’t normally sketch, but sometimes I will if I get an idea that I don’t want to forget. In this case, I happened to have this mini sketchbook with me that my wife had given to me for our anniversary. Every year, we give each other a gift that aligns with the traditional gifts according to that year. Five years is supposed to be something made of wood. She had this sketchbook made using fallen (not harvested) Ponderosa Pine, which is the state tree of Montana where we honeymooned. Special Thanks to Rob Kaz for being so kind to do an interview with us (and thanks again to Crissy for conducting the interview!) Rob let us know that his favorite park is Epcot, favorite character is Stitch and his favorite attraction is Pirates of the Caribbean. 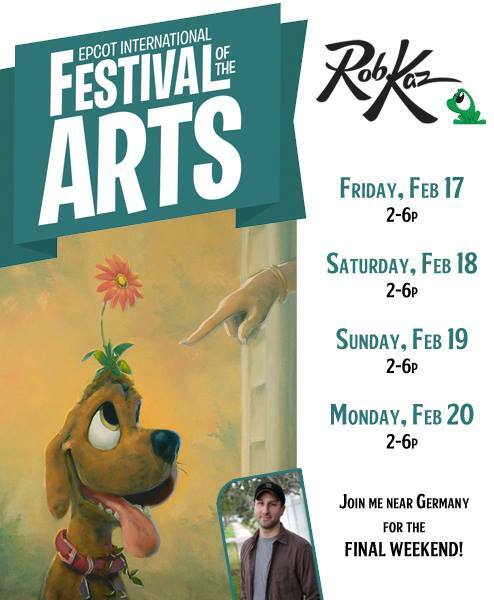 Be sure to stop by and visit Rob this weekend (Feb 17 – 20) from 2 – 6 PM near the Germany Pavilion and get to know Rob Kaz more!